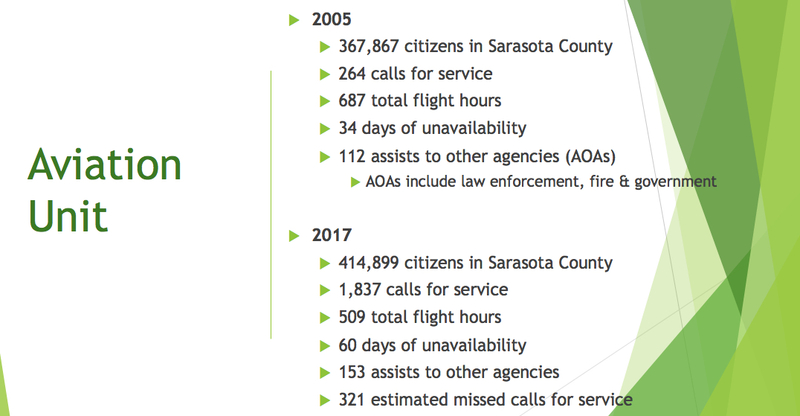 Not only does the Sarasota County Sheriff’s Office aviation unit — Air 1 — enable officers to track and capture suspects, Sheriff Tom Knight explained to the County Commission on May 9, but it also has proven invaluable in firefighting and search-and-rescue operations. He and his staff estimate that Air 1 was unable to respond to 321 calls for help in 2017, Knight told the commissioners during their regular meeting on May 9. Yet, as population continues to grow countywide, he said, and demand for the types of assistance the helicopter can provide grow as well, the need for a second aircraft has become critical. The number of homes in the county is anticipated to increase 15% by 2025, Knight noted, to a total of 267,420. 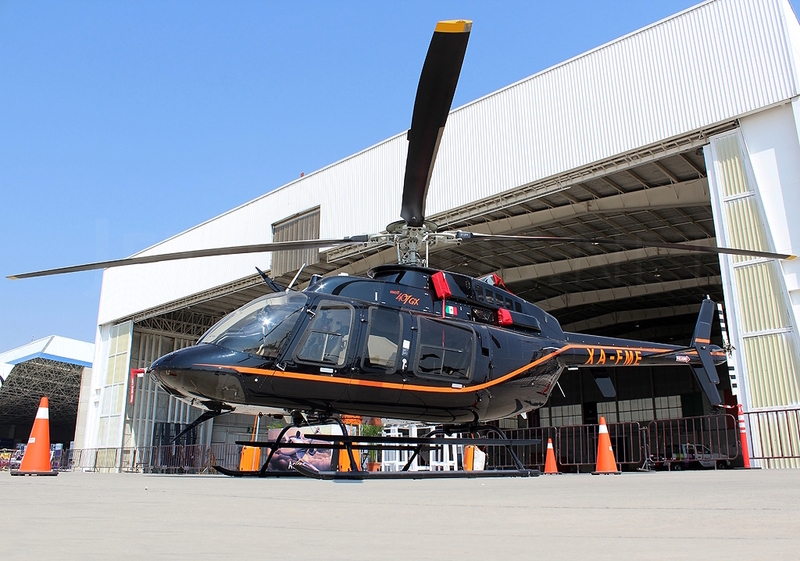 His staff was able to find a pre-owned, 2012 Bell 407GX helicopter that is available for purchase for $3,075,000, Knight pointed out. If the Sheriff’s Office had to buy a new one — given expected price climbs and the wait for new aircraft being produced in China — the expense most likely would grow to $5.5 million, he said, and the aircraft would not be available before the fourth quarter of 2019. Even if his staff could find a new Bell helicopter of the same make as the pre-owned one, he added, the cost would be about $4.5 million, with another $1 million needed to outfit it with equipment for law enforcement purposes. The aircraft already is outfitted with most of the equipment the Sheriff’s Office would need, Knight added. The total expense for the pre-owned aircraft — with the addition of specialized equipment for Sheriff’s Office operations — would be $3,451,500, a memo to the commission explained. On a motion by Commissioner Paul Caragiulo, seconded by Commissioner Alan Maio, the board voted unanimously to approve the use of impact fees for the 2012 Bell helicopter. “We are a medium-size county, so to have two helicopters seems a little extravagant,” Detert said. Moreover, Detert continued, unless the increase in population is expected to be all criminals, she did not understand why the second helicopter was needed. New residential areas will attract more criminals, Knight replied. Therefore, the Sheriff’s Office needs to increase its capacity to fight crime. The Sheriff’s Office’s chief pilot, Brent Wineka, also noted that a number of surrounding counties have multiple helicopters. For example, he said, Manatee has two, Charlotte has five, Collier has three, Pasco has four and Lee County has three. Knight pointed out that he sold the Sheriff’s Office fixed-wing plane after he became sheriff. She was referring to the expected passage of another homestead tax exemption, which will be on the November General Election ballot. 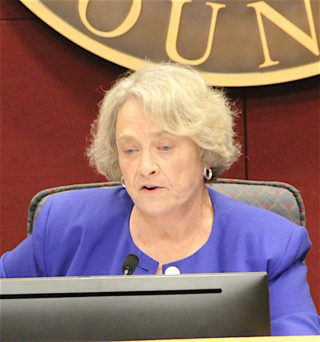 If voters approve it — and local government leaders predict they will — Sarasota County will have an $8-million hole to plug, she pointed out. 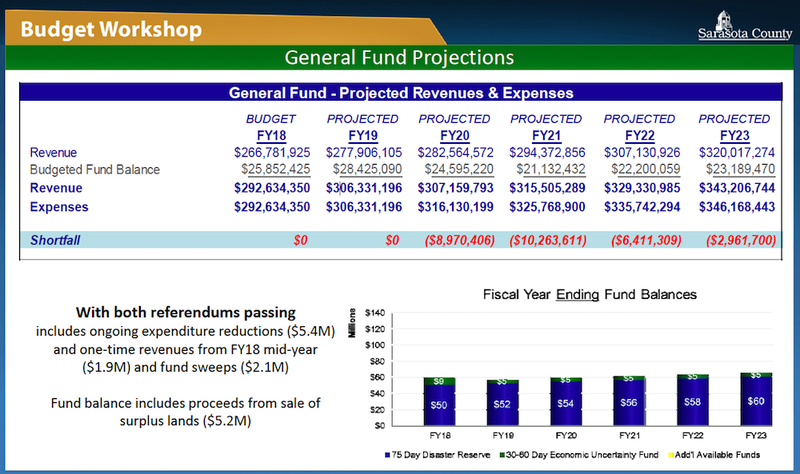 Administrative staff has explained that the County Commission would be faced with that decline in revenue beginning in the 2020 fiscal year. “I think every sheriff in the state is concerned,” Knight told Detert. Detert also noted that the County Commission last year approved the purchase of the building on Cattleridge Boulevard where Knight moved his administrative offices, his forensics lab and evidence storage. She further alluded to her frustration in April when staff appeared before the board to seek approval of a new roof and heating, ventilation and air conditioning system (HVAC) for that building, at a cost of $1.3 million. 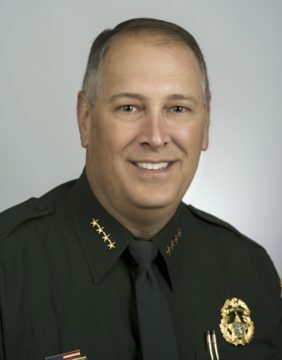 Although the inspection of the structure before the purchase was finalized indicated both the roof and the HVAC system would not last more than another two to four years, and the seller agreed to cover slightly more than $3 million in expenses to transform the structure for the Sheriff’s Office, Knight and his staff requested features other than a new roof and HVAC system. Detert asked Knight on May 9 for assurance that he would not come back to the board later to say that the second helicopter’s cost had risen. “I can assure you,” Knight responded, “and the roof won’t leak on it,” he added with a laugh. “It doesn’t need air conditioning?” Detert replied. “It’s already got it,” Knight told her. “I’m glad you heard that last argument,” she said of her comments about the Cattleridge Boulevard facility funding request. “You’ve made a good case today,” she added. If the commission did not go ahead and purchase the pre-owned Bell helicopter the Sheriff’s Office had found, Commissioner Caragiulo pointed out, the expense would be greater in the future. During his May 9 presentation, Knight showed the commissioners video clips to illustrate the capabilities of the Air 1 unit. The first showed the helicopter deploying a type of bucket that can hold 210 gallons of water for use in fighting fires. That weight puts considerable strain on the aircraft, Knight noted. The second video showed the use of Air 1 in locating a bicyclist who had become lost in the Carlton Reserve in South County during a competition. Family members had called the Sheriff’s Office for help, Knight pointed out; staff was able to determine the general area where the cyclist had used his cellphone to call his family. He had completed 45 miles and was dehydrated “and in distress” when Air 1 located him and was able to direct a deputy to the scene to rescue him, Knight added. The third video showed a pair of boaters whose vessel had capsized during a regatta on March 3. The temperature in the Gulf of Mexico was only 73 degrees, that day, Knight noted. The Coast Guard had requested the Air 1 search, he continued, as — with about 300 sailboats in the Gulf — it would have been very difficult for the office’s Marine Patrol to locate the people who needed help. The two men were spotted about 2 miles offshore of Turtle Beach, Knight said. Air 1 then was able to direct the Marine Patrol crew to the location. 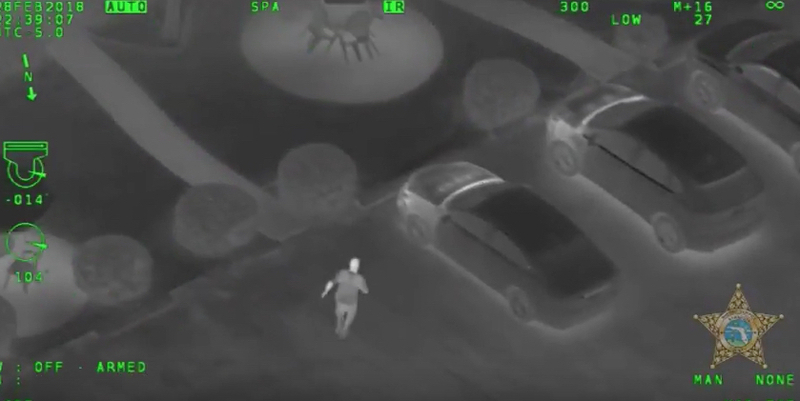 Finally, Knight showed video of a suspect trying to elude officers in Nokomis, with Air 1 able to spot the person and keep him in sight until deputies could arrive. “That’s how versatile the helicopter is,” he told the commissioners. The Sheriff’s arguments to justify his new flying machine could very well be valid. The Board’s arguments that there is no alternative but to cut needed services, while still facing a shortfall in a few years, is ludicrous, and irresponsible. Government has the means and the mandate to pay for itself – without the reflexive knee-jerk of selling our public lands. Once they’re gone, they’re gone forever.